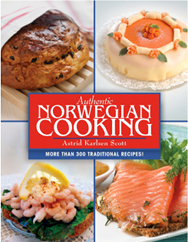 Astrid Karlsen Scott a native of Norway, is internationally known for her books on Norwegian culture. Her award-winning video, Christmas in Norway, has been shown on television in the United States and in Europe. She is also president of Nordic Adventure, a company dedicated to the promotion of Norwegian culture. She and her husband, Melvin McCabe Scott, Jr., live in Olympia, Washington. You can also order a DVD — titled Cooking Norway Style ($29.95) — in which Scott shows you how to prepare many dishes that Norwegians consider vital to their Christmas.